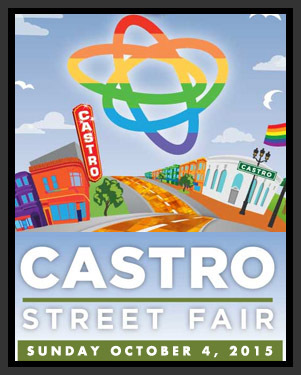 Castro Street Fair this Sunday! The fair features multiple stages with live entertainment, DJs, food vendors, community-group stalls as well as a curated artisan alley with dozens of Northern California artists. This year, entertainment includes: Emcee Honey Mahogany, Cheer SF, San Francisco Lesbian Gay Freedom Band, The Ethel Merman Experience, & more! You’ll also get to show off your dance skills on the Country & Western dance floor. And explore the Kink Karnival Alley, filled with games, contests, vendors, & more! The Fair is located in the heart of San Francisco’s Castro District, at the intersection of Market & Castro Streets and the surrounding area. The Castro Street Fair is a community street celebration that was founded by Harvey Milk in 1974. Hundreds of local artists, vendors, craftspeople, and organizations line the streets and celebrate the diversity of the neighborhood. Stages with live entertainment and dance stages can be found throughout the fairgrounds.